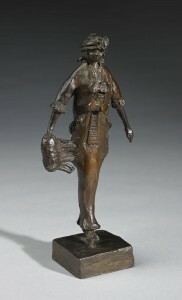 Myers exhibited fifteen of her small sculptures at the Folsom Galleries in New York in late 1912. According to her autobiographical notes, Arthur B. Davies, the president of the Association of American Painters and Sculptors, saw her exhibition and selected nine of what she termed her “statuettes” to include in the Armory Show. Her husband Jerome Myers was an active member of the A. A. P. S. and helped organize the exhibition. Portrait Impression of Mrs. D. M. was lent to the Armory Show by its subject, Mrs. Daniel H. Morgan. Born Grace Dwight, the daughter of General Henry C. Dwight, a former mayor of Hartford, Connecticut, she and Daniel Morgan led a prosperous life on East Seventy-First Street in New York City. They were active collectors of modern art: Daniel Morgan made the first purchase at the Armory Show, three Redon paintings on February 19. Grace was a longtime friend of Edith Dimock Glackens, the wife of the painter William Glackens. She is portrayed sitting on the sofa at right in Glackens’s 1911 Family Group (National Gallery of Art, Washington, D. C.) wearing a dress, hat, and fur that are nearly identical to what she wears in the sculpture. The art historian William H. Gerdts described the portrayal: “Grace Morgan, just back from Paris, is stylish to the hilt, wearing a newly acquired feathered hat and red dress.”  Family Group was also exhibited at the Armory Show. Ethel Myers Papers, 1913-1960, Archives of American Art, Smithsonian Institution, microfilm reel N68-6, frame 42. The other works by Ethel Myers included in the Armory Show were: The Matron, 1912; Fifth Avenue Gossips; Fifth Avenue Girl, 1912; Girl from Madison Avenue, 1912; The Widow; The Gambler, 1912; Upper Corridor; and The Duchess. Milton Brown, The Story of the Armory Show, 2nd ed. (New York: Abbeville Press, 1988), 120. William H. Gerdts, William Glackens (New York: Abbeville Press, 1996), 93. Frank Jewett Mather, Jr., “The Armory Exhibition.—II.,” The Nation 96:2489 (March 13, 1913), 268.